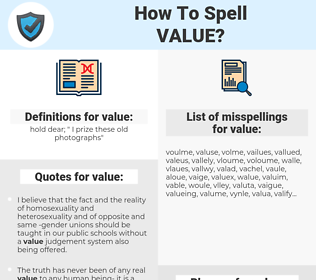 What are the misspellings for value? What are the common mistypes for value? What does the abbreviation value mean? What are the quotes for value? What are the rhymes for value? What are the translations for value? 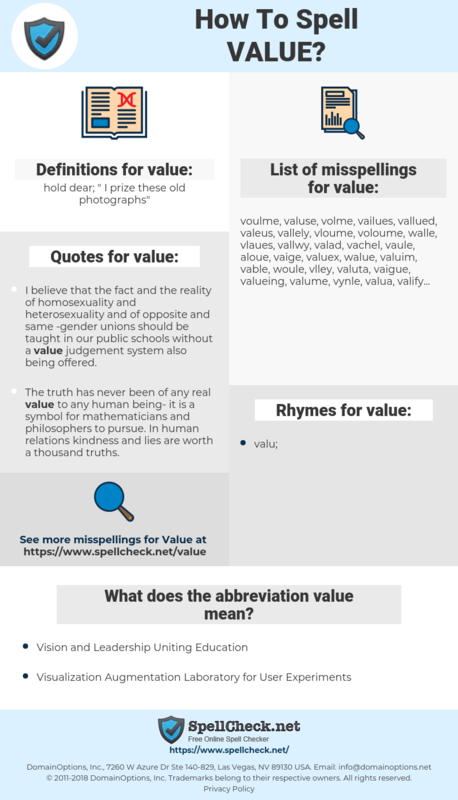 What are the common typos for value? This graph shows how "value" have occurred between 1800 and 2008 in a corpus of English books. I believe that the fact and the reality of homosexuality and heterosexuality and of opposite and same -gender unions should be taught in our public schools without a value judgement system also being offered. The truth has never been of any real value to any human being- it is a symbol for mathematicians and philosophers to pursue. In human relations kindness and lies are worth a thousand truths. 值, 价值, 重视, 顾惜, 数值, 估价. respecteren, waarderen, waarde, aan waarde hechten, op prijs stellen, taxeren, om geven, belangrijk vinden. valoriser, estimer, priser, valeur, importance, valorisation, montante. Bedeutung, bewerten, Nutzen, Geltung, taxieren, Wichtigkeit, Wert, Betrag, Größe, Wertschöpfung, Wertigkeit, Stellenwert, Valuta, Festwert, Relevanz, Kostbarkeit, Bedeutsamkeit, Werthaftigkeit, den Wert schätzen, hoch achten, Nut. valore, prezzo, pregio, importanza, significato. 価値, 値, 価, バリュー, 値うち, ち, 尊, あたい, 尊ぶ, かかく, 貴ぶ, ふむ, ひょうか, たっとぶ, とうと, 價, 惜しむ, 践む, おしむ, 有難み, 愛しむ, たっとむ, たっと, 貴, 踏む, 有り難み, かう, ありがたみ, ありがた味, 尊む, 履む, 貴む, 有難味, とうとぶ, 有り難味, 有難さ, ありがたさ. reconhecer, custo, avaliar, valorizar, importância, utilidade. precio, evaluar, valor, calcular, cantidad, importe, calidad, provecho, valía, valorar, tasar, apreciar, estimar, cifra, costo, utilidad.